We believe technology can contribute to help solve some of the world’s most pressing challenges and we want to support innovators who are finding new ways to make an impact. This is why we’re announcing the third European edition of the Google Impact Challenge in France, a program supporting non-profits who are using technology to have a positive impact. Four winners will each receive a €500,000 grant, as well as mentoring from Google employees, to help make each project a reality. One winner will be chosen by public vote, and the other three by a judging panel made up of Bernard Kouchner, former French Minister of Foreign Affairs; Nadia Bellaoui, President of Le Mouvement Associatif; Ismaël Le Mouel, founder of HelloAsso; Anne-Cécile Mailfert, President of Osez le Féminisme; Alain Deloche, Co-Founder of La Chaine du Coeur; Nick Leeder, Managing Director of Google France; and Jacquelline Fuller, Director of Google.org. Other Google Impact Challenges around the world have supported ideas ranging from smart cameras for wildlife conservation to solar lights for off-grid communities to a mobile application that helps protect women from domestic violence. Technology can make a real difference in tackling some of the world’s biggest social challenges. We can’t wait to see what French non-profits will come up with. This entry was posted in Google Europe Blog and tagged Europe, France on April 30, 2015 by European Public Policy Blog. 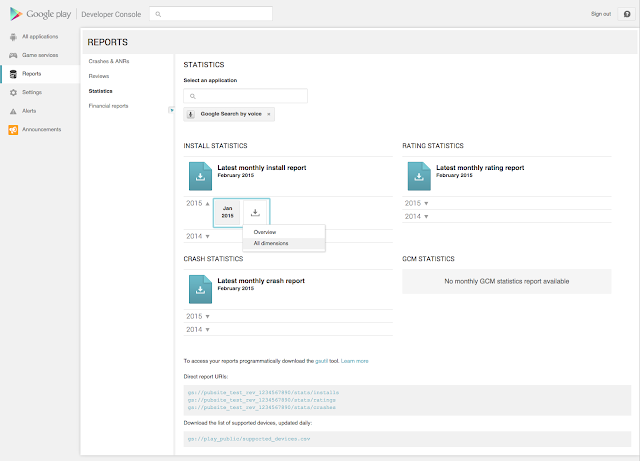 We’ve upgraded the AwReporting tool to use the latest AdWords API version, v201502. The code changes were made according to the migration guide. Note that besides code changes, the database tables’ column names have also been updated to reflect the new report field names. Since these changes are scattered around many tables, you can run this version of AwReporting on a new database schema, then use the schema generation command to generate both database schemas and compare them. You can also create SQL scripts to import data from old database tables to new ones with updated column names. We’ve put the code changes in the v201502_upgrade branch. Please feel free to pull this branch and give it a try. Remember to update the properties file to use the new report field names. This upgrade branch will be merged into the master branch at the end of May. If you have any questions or feedback regarding this upgrade, let us know via the project’s issue tracker. This entry was posted in Google Ads Developer Blog and tagged AdMob, Ads, AdSense, AdWords, adwords_api, Developer, DoubleClick, reporting on April 30, 2015 by Google Ads Developer Advisor. This entry was posted in Uncategorized on April 30, 2015 by YT Creators. This entry was posted in Google Analytics Blog and tagged Analytics, Announcements, attribution, Google Analytics on April 30, 2015 by Adam Singer. Cross-posted to the Google Maps Blog. The days are getting longer in Canada’s Arctic. The sea ice is breaking up, Arctic heather is poking through the snow-covered tundra and the arrival of the migratory snow bunting is days away. Summer is right around the corner. And today, in close collaboration with Parks Canada, we’re thrilled to share a glimpse of Canada’s Northern National Parks and the high north’s breathtaking summer season through the lens of Street View and Google Maps. These are some of Canada’s most remote National Parks. In spite of challenges posed by this vast geography, the far north also presented a unique opportunity. For example, Ivvavik National Park looks as bright and sunny as midday. But Parks Canada operators were collecting this imagery close to midnight, taking advantage of the far north’s endless summer days. Virtual visitors can marvel at the sweeping glaciers and dramatic fjords of Auyuittuq, discover the British Mountains and the Firth River Valley in Ivvavik, and immerse themselves in Tuktut Nogait’s stunning canyons and waterfalls along the rugged Brock River. And, not to be missed, be sure to check out the spectacular towering peaks of the Torngat Mountains, the grandeur of Canada's only salt plains and take a Street View stroll in the historic Sweetgrass bison corrals of Wood Buffalo National Park – Canada’s largest national park. Ivvavik National Park protects a portion of the calving grounds of the Porcupine caribou herd. Some of the imagery from Ivvavik was collected as late as 11pm. Overlooking La Roncière Falls in Tuktut Nogait National Park and the Hornaday River’s awe-inspiring canyons and waterfalls. Auyuittuq National Park images were gathered primarily from the water. The Street View Trekker was positioned on a boat which sailed along the park's coastline. Since starting work together in 2013, Parks Canada and Google have collected imagery from over a hundred of Canada’s national parks, national historic sites and national marine conservation areas. Our work in the north, however, is not finished and we look forward to connecting Canadians and the world to more of our country’s majestic northern national parks in the near future. In the meantime, enjoy a trip north on Google Maps... the Arctic summer sun is not going down on these amazing Street View images anytime soon. This entry was posted in Google Canada Blog and tagged Google Maps on April 30, 2015 by Aaron Canada. Everyone remembers a good teacher. They nourish our interests and fuel our passions. Many of us have ended up in the careers we’re in because of an influential teacher we met along the way. So it’s critical that teachers are equipped to give our kids the skills they need for the economy of the future. And when you look at how different fields from medicine to banking are rapidly digitising, it’s clear our teachers need to be able to teach computational skills. Australia and New Zealand have some wonderful people teaching computer science, like Graeme Breen from Mountain Creek Secondary School in Brisbane, who teaches computer science to high school students. Graeme has been teaching since 1989 and says he wants to gives his students the technology skills they need to one day start their own companies. We need more Graemes. To help this, Google funds workshops that equip teachers to teach computer science. The program, Computer Science for High Schools (CS4HS), provides teachers with the skills and resources they need to teach computational thinking and computer science concepts in fun and engaging ways. And we’ve just announced the latest batch of funding recipients (see the list below). Globally, we’ve helped train more than 12,000 teachers and reached over 613,000 students in more than 230 locations since we started this program. Closer to home, we are supporting 25 organisations across Australia and New Zealand who will provide this important training to K-12 school teachers. This year, we hope to reach around 3,000 high school, primary school and pre-service Aussie and Kiwi teachers. This entry was posted in Australia Blog and tagged Australia on April 30, 2015 by Johnny Luu. As part of our ongoing effort to improve app promotion features in AdWords, we are making some changes to mobile app install ads (also known as click-to-download ads) on the Search Network. Starting July 1, 2015, we will support the creation of app install ads for the Search Network only in the Search Network only - Mobile app installs campaign type. In addition, app install ads created for the Search Network outside of this campaign type will stop running in July 2015. This includes any app install ads running together with website text ads in a Search Network only - All features campaign. When creating new app install ads for the Search Network, make sure you create them only within Search Network only - Mobile app installs campaigns. These campaigns have their advertisingChannelType set to SEARCH and advertisingChannelSubType property set to SEARCH_MOBILE_APP. Retrieve your Search campaigns containing app install ads. For each campaign, create a new campaign with similar settings (such as location targeting, device targeting, ad delivery, etc.) with the advertisingChannelSubType changed to SEARCH_MOBILE_APP. Mirror over your ad groups in the old campaign to the new campaign. Mirror over your app install ads from the first campaign to the second campaign, in the corresponding ad groups. [Optional] Delete or pause app install ads in the old campaign. See our Help Center guide for more details. If you have any further questions about this change, let us know via our forum or Google+ page. This entry was posted in Google Ads Developer Blog and tagged AdMob, Ads, AdSense, AdWords, adwords_api, Developer, DoubleClick, search_network on April 29, 2015 by Google Ads Developer Advisor. The SDK can be included as a framework in your project. The SDK now supports ad playing in the background. Prior to today’s release, importing the SDK involved manually adding every header file to your project, importing every header file individually in your source, and manually including the required frameworks. With the new framework model, you can add a single .framework file to your app and replace all of your header import source lines with a single import statement. Locate and remove each instance of an imported IMA header file in your source (these will look like #import “IMA<something>.h”). Remove all of the IMA header files and the IMA library file from your project. Under "Build Phases” > “Link Binary With Libraries”, click the plus sign, select “Add Other...”, and navigate to the downloaded and extracted SDK files. Select GoogleInteractiveMediaAds.framework from whichever folder applies to your implementation (with or without AdMob) and click “Open”. Follow the two steps above for CocoaPods users. Since our launch, one of the most requested features has been background ad playback. Suppose, for example, you author a music streaming app, and you want to be able to request and play ads in the background. With today’s release, however, we now support requesting and playing ads in a background service. For more info and implementation instructions, see our Background Ad Playback guide. As always, if you have any questions feel free to contact us via the support forum. This entry was posted in Google Ads Developer Blog and tagged AdMob, Ads, AdSense, AdWords, Developer, DoubleClick, ima_sdk, ios on April 29, 2015 by Google Ads Developer Advisor. This entry was posted in Android Developers Blog and tagged Android, Developer Console, Google Cloud Platform, Google Play, LondonEng on April 29, 2015 by Reto Meier. This entry was posted in Google and Your Business and tagged Business, Google Shopping on April 29, 2015 by Jade Wang.